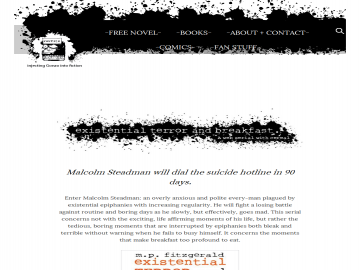 Malcolm Steadman will dial the suicide hotline in 90 days. Enter Malcolm Steadman: an overly anxious and polite every-man plagued by existential epiphanies with increasing regularity. He will fight a losing battle against routine and boring days as he slowly, but effectively, goes mad. This serial concerns not with the exciting, life affirming moments of his life, but rather the tedious, boring moments that are interrupted by epiphanies both bleak and terrible without warning when he fails to busy himself. It concerns the moments that make breakfast too profound to eat. It is updated every Wednesday. Existential Terror and Breakfast has not been tagged yet. Help others find Existential Terror and Breakfast by tagging it! Existential Terror and Breakfast has not been reviewed yet. Existential Terror and Breakfast has not been recommended yet.